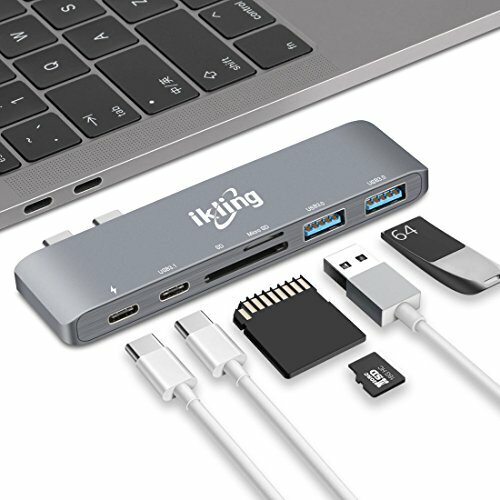 The ikling Aluminum Type-C Pro Hub Adapter is the newest addition to our USB-C collection and the perfect companion for your 2016 MacBook Pro. It occupies two USB-C ports and gives you back 2 USB 3.0 ports ,1 thunderbolt 3 port and the SD/Micro SD card slot. Added Thunderbolt 3 port supports data transfer of speeds up to 40Gb/s. That's fast enough to transfer a high-definition movie in seconds. Don't worry, your everyday ports are still here. Utilize the 2 USB 3.0 ports for extra data transfer and MicroSD/SD card reader for video and photo editing - on the go. Due to the energy-saving design, SD and MicroSD Card cannot be used at the same time. They would work in accordance with the order of the insert. Please do not plugging / unplugging the devices when transferring data to avoid data loss. It would be recommended using your original APPLE charger adapters and cables to charge via the Type-C port. If you have any questions about this product by ikling, contact us by completing and submitting the form below. If you are looking for a specif part number, please include it with your message.